Some of the best pranks rely on the victim to apply the prank on themselves. In this one, sculpt some cream cheese on top of a deodorant stick. Sculpt it to make it look like part of the deodorant stick. Your unsuspecting victim will end up putting cream cheese in the arm-pits! Some liquid soaps are rather cloudy and can tolerate a fair amount of egg (whites and yolk) mixed into it before it starts to look weird. Others look clear and pretty much like egg white, so you can just add the egg white in. 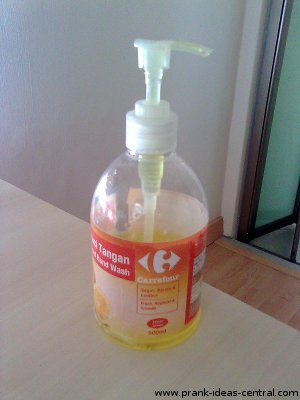 The point is to add the egg into an existing liquid soap dispenser in your home, or place it in an empty dispenser that you can then plant in your bathroom. This toilet prank may be more interesting if you add in rotten eggs. There are several variations of this prank. 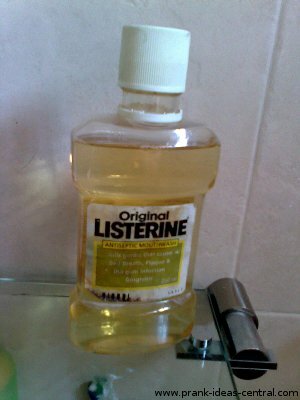 One is to add in vinegar into mouthwash bottles and your victim will get a nasty surprise when he or she tries to use it. You can put water with food coloring, if necessary, into an empty bottle of the brand of mouthwash that your victim uses. Add some salt for good measure, then watch them spit it out! Soap should lather, shouldn't it? Once you layer it with nail polish, it won't. Make sure that you dry off the soap properly with a towel before applying nail polish evenly over its surface. 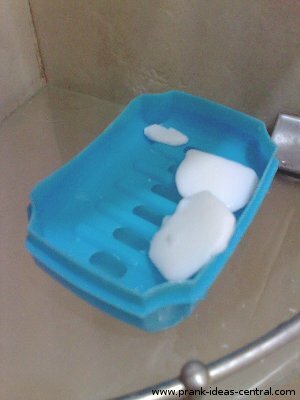 When your victim tries to use the soap, well, it just won't 'work'. What's more frustrating than having something not work the way you expected? Not knowing who made it so, of course!